The Coptic Church was established in the name of the Lord Jesus Christ by St. Mark the Evangelist in the city of Alexandria around 43 A.D. The church adheres to the Nicene Creed. St. Athanasius (296-373 A.D.), the twentieth Pope of the Coptic Church effectively defended the Doctrine of the Lord Jesus Christ's Divinity at the Council of Nicea in 325 A.D. His affirmation of the doctrine earned him the title: "Father of Orthodoxy" and St. Athanasius "the Apostolic." The term "Coptic" is derived from the Old Egyptian name of Egypt "E-Ka-Ptah" meaning "The Abode of the spirit of Ptah, the major God of Memphis" When the Greeks occupied Egypt in the fourth Century BC, they pronounced "Ekaptah" with a Greek accent "Aigyptos". When the Arabs arrived in Egypt in the seventh century, they called the Egyptians "qibt." Thus the Arabic word "qibt" came to mean both "Egyptians" and "Christians." The term "Orthodoxy" here refers to the preservation of the "Original Faith" by the Copts who, throughout the ages, defended the Old Creed against the numerous attacks aimed at it. His Holiness Pope Shenouda III is the 116 Successor of St. Mark the Evangelist. His Holiness' era is marked by a remarkable growth in the number of Coptic churches abroad. To address the needs of these churches, His Holiness felt the urgency to establish dioceses abroad. 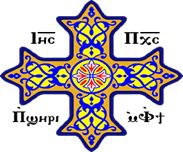 Thus the first Coptic Orthodox Diocese to be established in the United States is the Diocese of the Southern United States in 1993. H.H. Pope Shenouda III appointed His Grace Bishop Youssef to oversee this Diocese. There are currently 51 priests serving the 38 churches and 28 Coptic communities located in the Diocese. If you would like to reach Fr. Kyrillos Makar, he may be contacted by telephone at 727-452-1188 or 727-771-2672, or by fax at 727-791-4291 or by email at frkyrillos@stmarystmina.org Fr. Meena Ghaly is the priest for St. Mary & St. Mina Coptic Orthodox Church located in Clearwater, FL. H.G. Bishop Youssef, with the presence of H.G. Bishop Serapion and H.G. Bishop Cherubim, ordained him priest on February 19, 2012 (Watch Ordination). Fr. Meena has been serving within the Diocese of the Southern United States since February 19, 2012. We pray that the Lord will continue blessing his service. Fr. Ermia Bishara is the priest for St. Mary & St. Mina Coptic Orthodox Church located in Clearwater, FL. H.G. Bishop Youssef ordained him priest on April 15, 2018 (Watch Ordination). Fr. Ermia has been serving within the Diocese of the Southern United States since April 15, 2018. We pray that the Lord will continue blessing his service.